July 2, 2012, 2:10 a.m.
It’s “The Future of News As We Know It,” an EPUB compilation of the Lab’s best in June — and an experiment in quick-turn ebook publishing. By Joshua Benton @jbenton July 2, 2012, 2:10 a.m. So I’m happy to say that you now have a new way to learn what we’re learning at the Lab — ebooks. And yes, it’s an R.E.M. pun. Ebooks are exploding — I spend a ton of time reading them on my iPad — and there are some people for whom a collected, collated package of news, commentary, and analysis is going to be more appealing than remembering to check in to our site every day or following along on Twitter. This is for them. I pulled this together both because I think there might be an audience for it and because I really wanted to learn about EPUB, which is becoming the lingua franca of ebook publishing. EPUB is mostly extremely unforgiving HTML and CSS, so it wasn’t too difficult a process, but I learned a ton in the process of building WordPress exporters and automating a lot of the backend-code creation. If people are interested, I’d be happy to share the tools and methods I built along the way. In any event, I’d love to hear from Lab readers about how this looks, what kinds of improvements you’d make, whether you’re interested in an ebook format for our content, and anything else that comes to mind. (I’d also love to hear from anyone reading on a non-Apple platform, since I’ve only tested it extensively on iPad/iPhone.) Get downloading! Q: How do I install this ebook in my ereader? — moving the EPUB into your Dropbox folder and then opening it from the Dropbox app on your iDevice. For other EPUB readers (Nook, Sony Reader, etc. ), follow the directions that came with it. For Kindle, you can load it onto a device by USB or by emailing it to yourself at your Kindle email address. POSTED July 2, 2012, 2:10 a.m.
Benton, Joshua. "Now available for download: Nieman Lab in ebook form." Nieman Journalism Lab. Nieman Foundation for Journalism at Harvard, 2 Jul. 2012. Web. 23 Apr. 2019. Benton, Joshua. "Now available for download: Nieman Lab in ebook form." Nieman Journalism Lab. Last modified July 2, 2012. 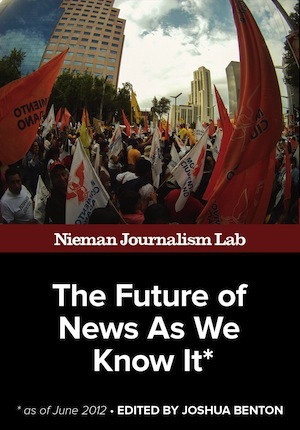 Accessed April 23, 2019. https://www.niemanlab.org/2012/07/now-available-for-download-nieman-lab-in-ebook-form/.